A managed flotation of Burma’s kyat currency from the beginning of April will be a step in the right direction but not enough to enable the country’s economy to slot back into the international financial community. That’s the view of one of the world’s experts on Burma’s badly corrupted economy. “It is a necessary but not sufficient step in the process of broader financial reform,” economist and editor of Burma Economic Watch Sean Turnell told The Irrawaddy this week. “The critical issue might be how a floating currency makes the government’s fiscal accounts move towards greater transparency and accountability. The latter virtues would be aided if the floating currency led to the proper recording of the foreign exchange revenues of Burma's state-owned enterprises, especially MOGE,” he said. Turnell, a professor at Macquarie University in Sydney, Australia, is referring to the Myanmar Oil and Gas Enterprise, which has for years been used by the military dictatorship to handle the growing international sale of gas. The country’s murky financial system, corrupted exchange rates and tightly controlled state banks are believed by many observers to have robbed Burma of billions of dollars earned from offshore gas and other natural resources, much of it sold to Thailand and China. Gas sales are set to increase considerably from 2013 when China begins purchasing over 6 billion cubic meters a year from the Bay of Bengal Shwe field. A managed flotation of the kyat will begin on April 1, according to Turnell, who recently visited Burma. Another urgent reform needed is the freeing of the central bank from state control and manipulation, he said. Currency reform is unrelated to the issue of Western countries ending their economic sanctions against Burma, said Turnell, but a more transparent financial system would certainly encourage the sanctions governments to loosen the straitjacket on the country. A managed flotation of the kyat would allow the Burmese central bank “to intervene in the foreign exchange market to influence the exchange rate, though not to determine any particular set value,” Turnell explained. A fixed exchange rate has permitted the military to manipulate payments for gas and other exports for their own benefit and has encouraged a currency black market. Even under the manipulated system, Burma’s officially declared foreign exchange reserves increased to US $5.5 billion by 2010 compared with a mere $200 million ten years earlier, according to Asian Development Bank figures. Much of that rise is attributed to gas sales. The official kyat rate to the US dollar is a laughable 6.4, which is 125 times higher than the more realistic “informal” black market rate of 800 kyat. 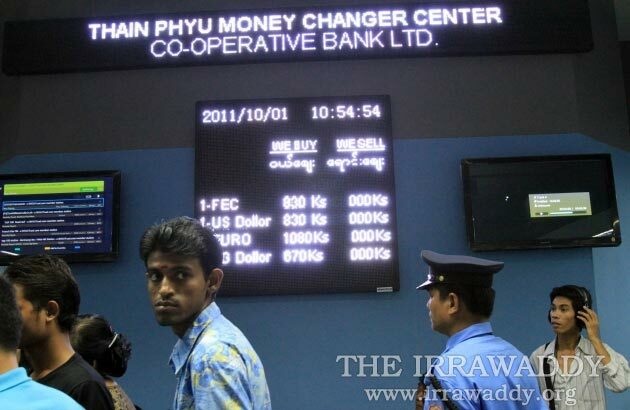 The official rate from April is expected to be closer to 800 kyat to the dollar. A central bank-managed floating kyat can be adjusted over the coming year or two as an expected avalanche of foreign investment money threatens to make the currency too strong and exports uncompetitive. An April flotation will coincide with the expected return of Japan as a major lender, and a review by the European Union of its economic sanctions—although the EU’s response is initially expected to be more dependent on the outcome of parliamentary by-elections than reform of Burma’s monetary system. Japan is Burma’s biggest creditor, owed more than $6 billion out of total international debts of over $11 billion, according figures disclosed recently by Finance Minister Hla Tun.